Design and code &copy; Community Sites 2004-2019 is the owner of the copyright for this website. The web server used by Ourgreatyarmouth.org.uk is run by UK Webhosting Ltd and located in Great Britain. 17 other websites are located on this web server. Most of them are provided in the english language. 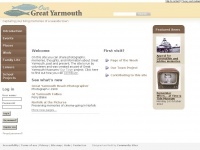 The websites of Ourgreatyarmouth.org.uk are hosted by a Microsoft-IIS server and were developed in the programming language ASP.NET. The content management system DotNetNuke is used. The markup language of the website is XHTML 1.0 Transitional. The visitor analysis software Google Analytics is used to analyze the visitors of the websites. The website does not specify details about the inclusion of its content in search engines. For this reason the content will be included by search engines.